For over 25 years, Ringmasters has provided the best in LDS jewelry and gifts. Our extensive line of CTR rings, necklaces, bracelets, young women jewelry, scripture cases, home décor, and many other products have inspired multiple generations of Latter-Day Saint families like yours. We are also the industry leaders in safety. Ringmasters is committed to providing high quality, reasonably priced and safe products for our customers. We are proud to say they are tested and certified. In short, when you purchase Ringmasters products, you get peace of mind from knowing they are safe and inspiration from the meaning and reminder that they provide. I really liked the look and feel of the spinner ring but after a month or so you can no longer read the CTR and spinning it has become difficult. beautifully made. spinning makes it a more cool ring than it already is. I love this one. 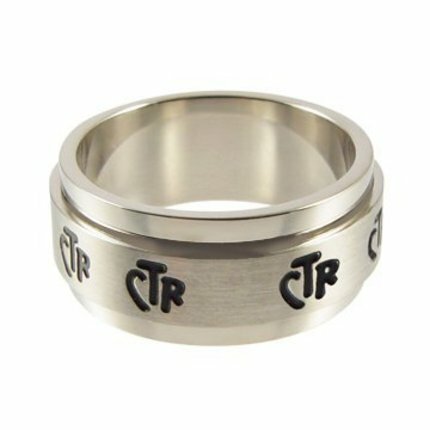 It's my newest addition to my CTR ring collection and it's great! I spin it all the time. Catches peoples' attention, too. I give it two thumbs up!